This week I'm featuring a fellow creative blogger friend, Tiffani of Totally RawKin Designs. Tiffani is a master at digi scrap. She has all kinds of cool designs for FREE on her blog. Now, I know nothing about digi scrapping but if it is anything like paper scrap booking then I'm sure it is addicting....humm maybe a bit cheaper as you don't have all the paper and supply's to purchase. I don't know, maybe I should research that one a bit more. I do think you have to have some super duper software to be able to create some of the designs and maybe to even use them. So, Tiffani, what is it and how do we novices use it? 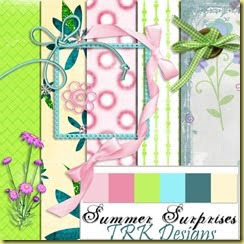 Here is one of Tiffani's Summer designs. So, no one had the answer to my question yesterday as to what this was used for and yes I know it is a tape measure. Okay, it was used to measure a cow to estimate their weight. Go figure. A tape measure to estimate a cow's weight? Maybe they used a giant scale to determine height...Thanks for Tiffani's mention. I am behind on Creative Bloggers BUT I will catch up! Did you ever find out what digi scrap was? I want to know. Where do you find a tape measure for cows?